Narrator:Throughout the Bible, God always saves His people. As part of God's big rescue plan, Israel grew from one family to a huge nation inside the country of Egypt. The Egyptians became afraid that the Israelites would try to take over the country, so they made the Israelites their slaves. The people of Israel were mistreated– and after hundreds of years, they cried out to God to send a savior. God sent Moses, an Israelite who had been trained both in Pharaoh's courts and in the sheep fields of Midian. God knew His plans for Moses long before Moses was born- just like He knows His plans for each of us. Let's listen to this story of a man whose life was shaped by God for great things. Miriam: Mother! What are you doing here by the river? Where are you taking the baby? Mother: Oh, Miriam, the king has said that every baby boy must be thrown into the River! I've hidden your brother for the last three months, but he'll be found soon. Miriam: What will you do with him? I hate the king, Mother! I hate him for treating us so harshly. Mother: My darling daughter, you must remember that God is in control. He holds us, your baby brother, and even Pharaoh in His hands. Now come, you must help me. Take this basket I've woven for him. I've sealed it with tar and pitch. Miriam: It's like a little boat for him! Mother: Exactly. Now, you must follow him, but keep your distance. Watch him from the reeds. See where the Lord will lead him. Mother: God of our father Abraham, take care of my child that he might live for your service. Pharaoh's Daughter: Come, my servant, attend me. It's a beautiful day to relax and bathe in the Nile. Attendant: As you wish, Your Highness. You know, you don't need to stay here in the city. Remember, as the daughter of Pharaoh, you could command a fleet of ships to take you anywhere on the Nile that you desire. Pharaoh's Daughter: Indeed, I think I might… what's that in the reeds? Bring me that basket! Pharaoh's Daughter: This must be one of the Hebrew children. But now he is mine. Pharaoh's Daughter: Yes, child? Come, you may approach me. Miriam: Your baby is beautiful. Will you need a nurse for him? Pharaoh's Daughter: Yes, I will. Miriam: I know someone who can serve you and help raise the baby. Pharaoh's Daughter: Yes, go and get her. I will pay her for her help. (Pause) I have a son, who will be a prince over all men. Because he was drawn from the water, his name shall be Moses. Oh, my son. You are destined for great things. Narrator: Moses grew up as an Egyptian prince, but he never forgot he was a Hebrew. One day, he went out and saw how hard his people were forced to work. He saw an Egyptian beating a Hebrew and he realized he couldn't just stand by and watch. The Egyptian: Come on, old man. Put your back into it! Faster! The Hebrew: You killed him. Moses: Get away quickly. No one saw what happened. I'll hide the body in the sand. Now go! The Hebrew: (running away) Thank you, my lord! Narrator: The next day he went out and saw two Hebrews fighting. Man One: Get off me! Man Two: Give it back! Man One: Leave me alone! Moses: Stop it. What are you doing? Why are you beating up one of your own people? Man One: Who put you in charge of us and made you our judge? Are you planning to kill me, just as you killed that Egyptian? Moses: Oh, no! Does everyone know what I've done? Pharaoh will certainly try to kill me! Narrator: Moses was right – Pharaoh did try to kill him. Moses had to run away to another country, the land of Midian, for fear of losing his life. But God wasn't finished with Moses. Moses became a shepherd, and one day years later, he was out with his flock when a very strange sight caught his eye He saw a bush filled with flames, and he could hear the crackling of fire…but the bush was not burning up. Suddenly, from the middle of the burning bush, Moses heard the voice of God. Voice of God: I have seen how my people are suffering as slaves in Egypt, and I have heard them beg for my help because of the way they are being mistreated. I feel sorry for them, and I have come down to rescue them from the Egyptians. I will bring my people out of Egypt into a country where there is good land, rich with milk and honey. My people have begged for my help, and I have seen how cruel the Egyptians are to them. Now go to the king! I am sending you to lead my people out of his country. Moses: Who am I to go to the king and lead your people out of Egypt? Voice of God: I will be with you. And you will know that I am the one who sent you, when you worship me on this mountain after you have led my people out of Egypt. Narrator: God sent Moses back to Egypt, telling him that everyone who wanted to kill him had died. When Moses approached Egypt, God sent his older brother Aaron into the wilderness to meet him. Moses told Aaron everything the Lord had commanded him to say. Then Moses and Aaron went to Pharaoh. Pharaoh: Who is this Lord and why should I obey him? I refuse to let you and your people go! Narrator: Pharaoh didn't want the Israelites to leave, because then he would lose his slaves. So he denied God's demand, and would not release the Hebrews. Because of Pharaoh's disobedience, God brought ten plagues upon the people of Egypt. Before each one, Moses warned Pharaoh what would happen. Moses told him the disasters were being sent by God. But each time, Pharaoh hardened his heart and refused to see that the God of Israel was much more powerful than any of the gods that the Egyptians worshipped. Moses: The water of the Nile will be changed to blood. Pharaoh: No, I will not let Israel go free. Moses: The land will be covered with frogs! Moses: The air will be filled with gnats and flies! Moses: Your animals will die, and your people will be covered with boils. Pharaoh: I will not release Israel. Moses: Hail will destroy everything in its path. Moses: Locusts will ravage your crops. Moses: Darkness will descend over the whole land. Pharaoh: I will not let Israel go! Narrator: The last plague was the worst. Voice of God: Know now that I am God. Take the blood of a lamb and smear it on the sides and tops of the doorframes of your houses. I will pass through Egypt and kill the first-born son in every family, and the first-born male of all animals. I am the Lord, and I will punish the gods of Egypt. The blood on the houses will show me where you live, and when I see the blood, I will pass over you. Then you won't be bothered by the terrible disasters I will bring on Egypt. Narrator: At midnight the Lord killed the first-born son of every Egyptian family, from the son of the king to the son of every prisoner in jail. He also killed the first-born male of every animal that belonged to the Egyptians. That night the king, his officials, and everyone else in Egypt got up and started crying bitterly. In every Egyptian home, someone was dead. Pharaoh: (Mourning and wailing throughout Pharaoh's speech) Get your people out of my country and leave us alone! Go and worship the Lord, as you have asked. Take your sheep, goats, and cattle, and get out. Narrator: The Hebrews knew they must leave Egypt quickly. They took all their belongings and followed Moses. But soon Pharaoh's hard heart returned. When he heard that the Israelites had left, Pharaoh changed his mind. He got his war chariot and army ready, and led them out to bring the Israelites back to Egypt. Pharaoh: The Hebrews are trapped. We have chased them to the banks of the Red Sea. There is no escape. Crowd 1: Wasn't there enough room in Egypt to bury us? Is that why you brought us out here to die in the desert? Crowd 2: Why did you bring us out of Egypt anyway? While we were there, didn't we tell you to leave us alone? Crowd 3: We would rather be slaves in Egypt than die in this desert! Moses: Don't be afraid! Be brave, and you will see the Lord save you today. These Egyptians will never bother you again. The Lord will fight for you, and you won't have to do a thing. Voice of God: Tell the Israelites to move forward. Then hold your walking stick over the sea. The water will open up and make a road where they can walk through on dry ground. Narrator: When Moses raised his hand over the sea, a miracle happened. The Lord sent a strong east wind that blew all night until there was dry land where the water had been. 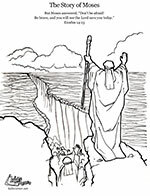 The sea opened up, and the Israelites walked through on dry land with a wall of water on each side! When all the Israelites had reached the other side, the Lord spoke again to Moses. Voice of God: Stretch your arm toward the sea—the water will cover the Egyptians and their cavalry and chariots. Narrator: Moses stretched out his arm, and at daybreak the water rushed toward the Egyptians. They tried to run away, but the Lord drowned them in the sea. God had once again saved His people. If you'd like to read more stories about God's people on their journey away from Egypt, they're in your Bible! Check out the books of Exodus, Leviticus, Numbers and Deuteronomy in the Old Testament.